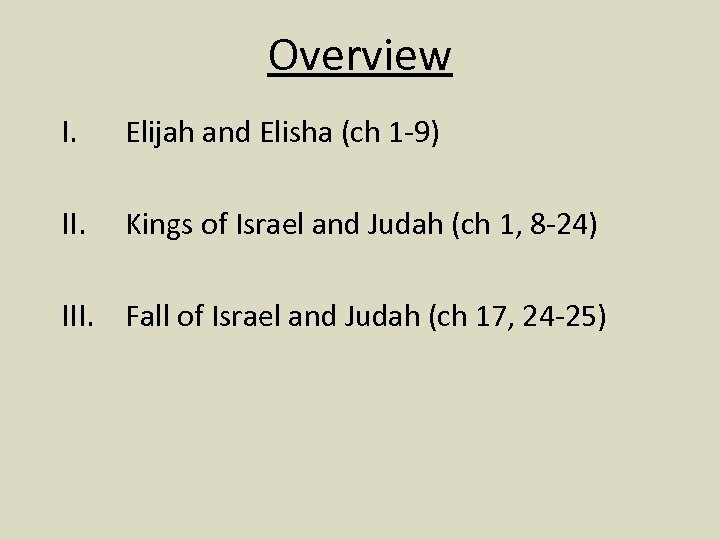 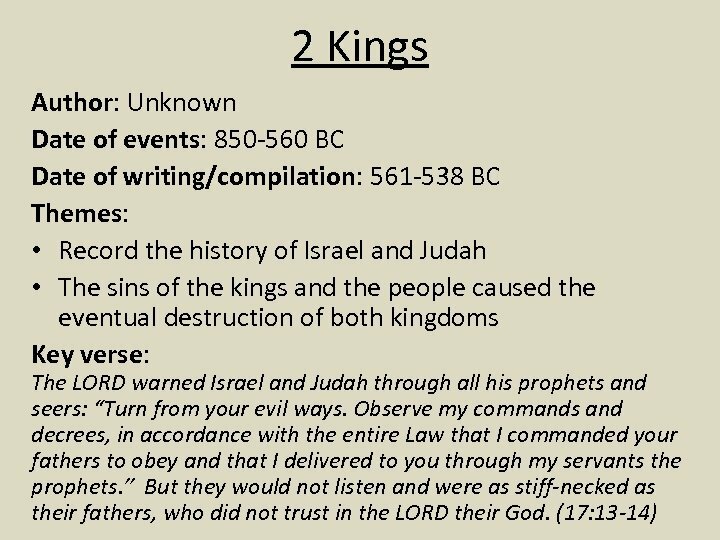 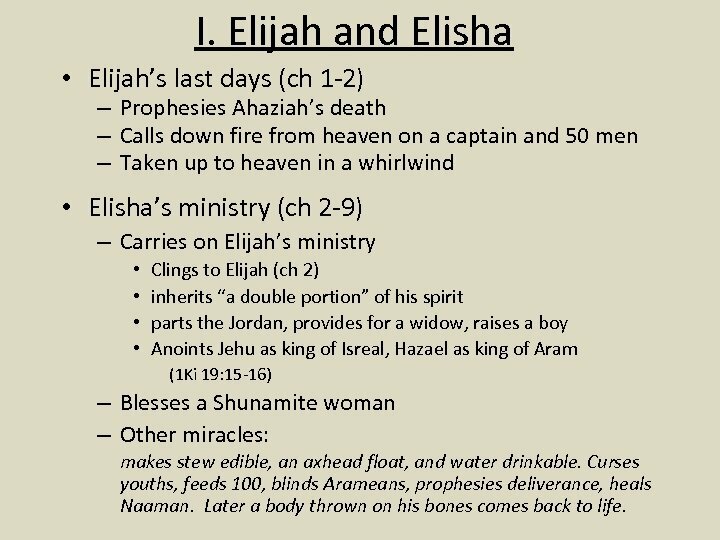 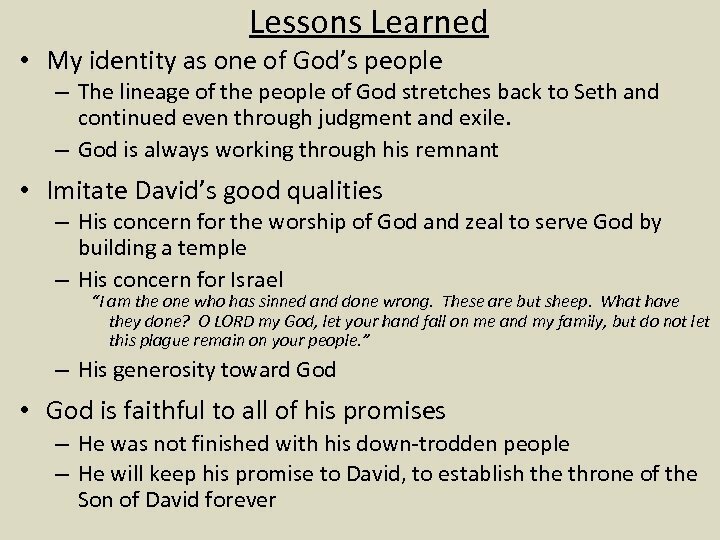 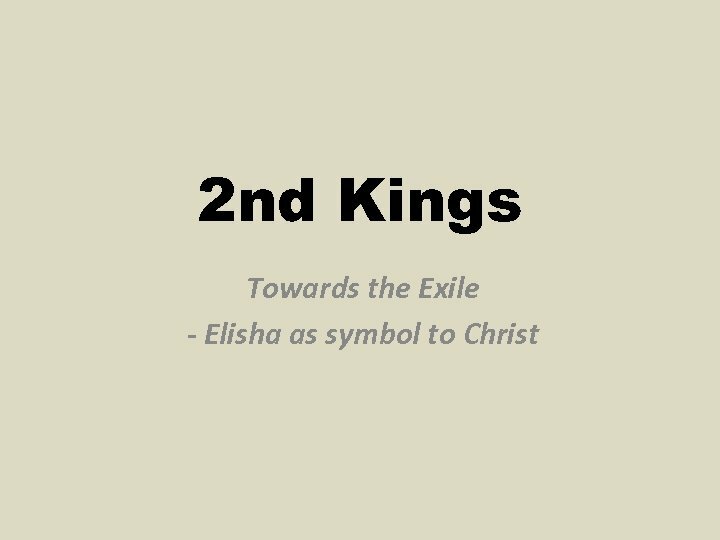 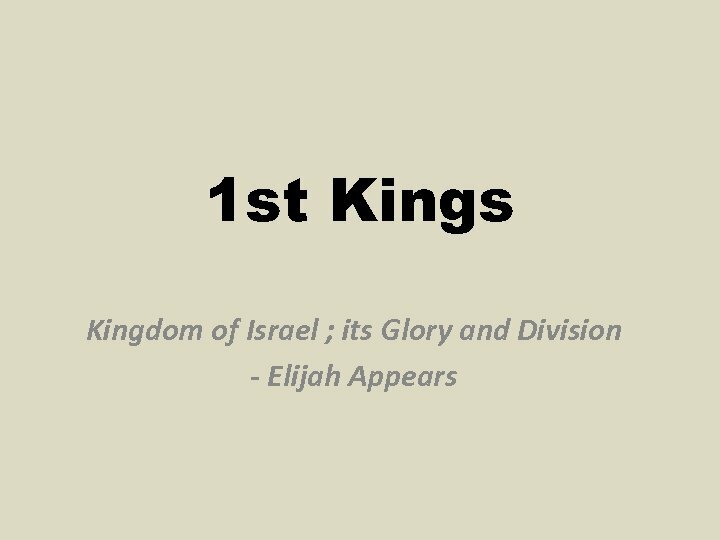 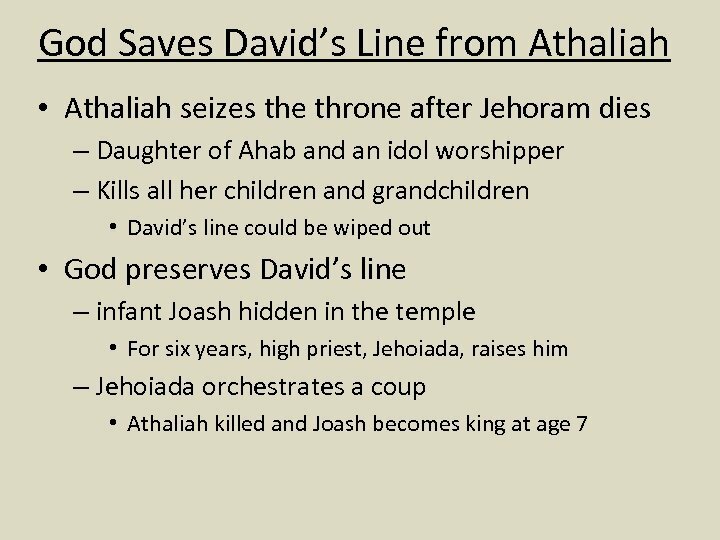 I. Elijah and Elisha • Elijah’s last days (ch 1 -2) – Prophesies Ahaziah’s death – Calls down fire from heaven on a captain and 50 men – Taken up to heaven in a whirlwind • Elisha’s ministry (ch 2 -9) – Carries on Elijah’s ministry • • Clings to Elijah (ch 2) inherits “a double portion” of his spirit parts the Jordan, provides for a widow, raises a boy Anoints Jehu as king of Isreal, Hazael as king of Aram (1 Ki 19: 15 -16) – Blesses a Shunamite woman – Other miracles: makes stew edible, an axhead float, and water drinkable. 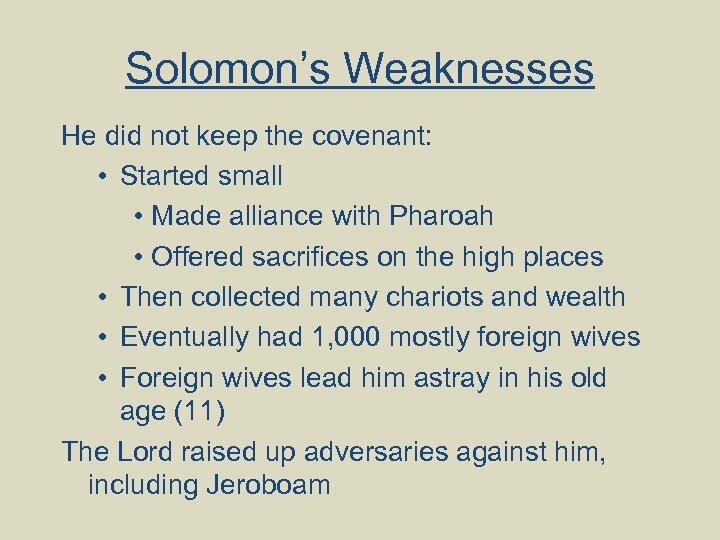 Curses youths, feeds 100, blinds Arameans, prophesies deliverance, heals Naaman. 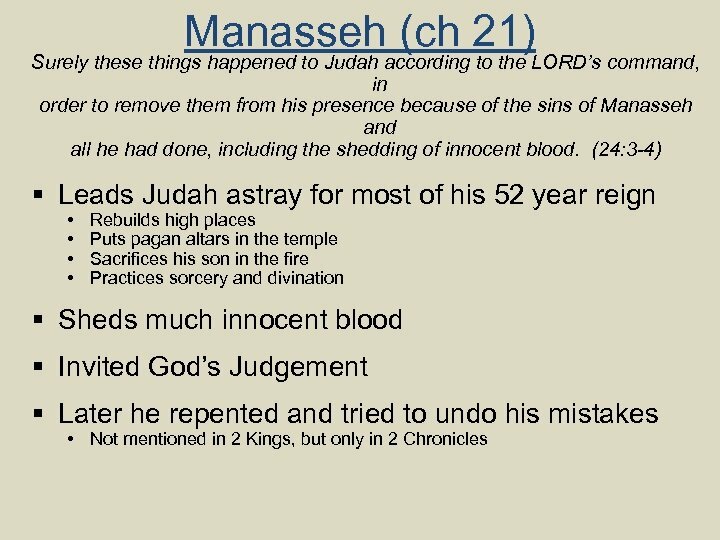 Later a body thrown on his bones comes back to life. 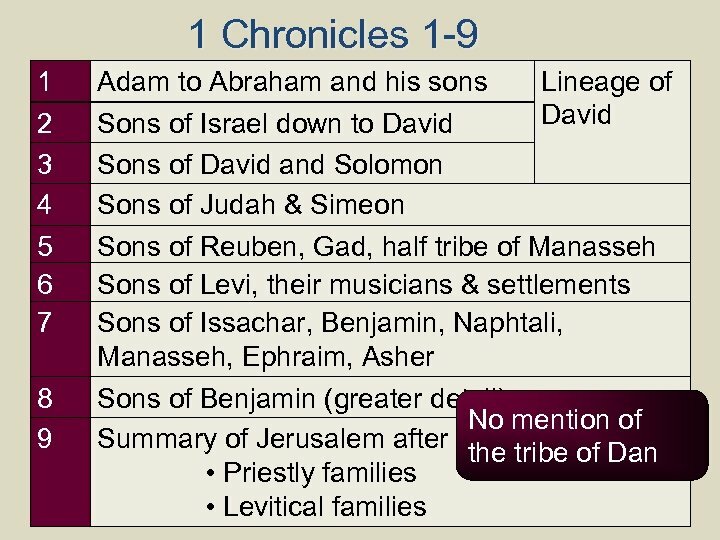 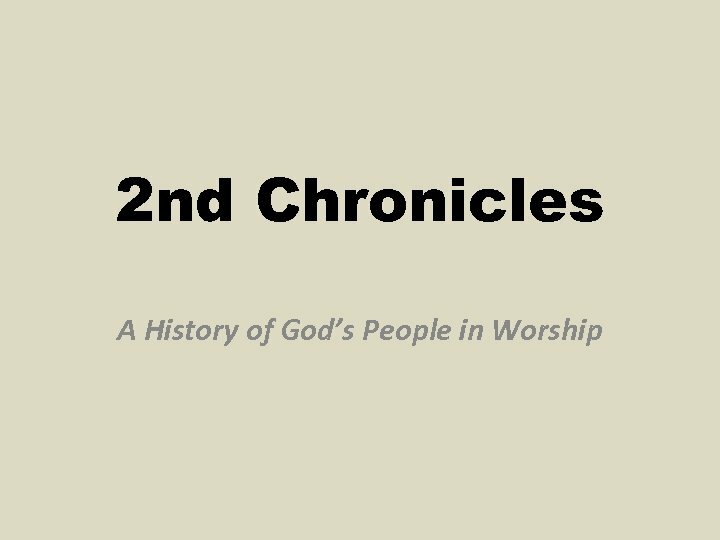 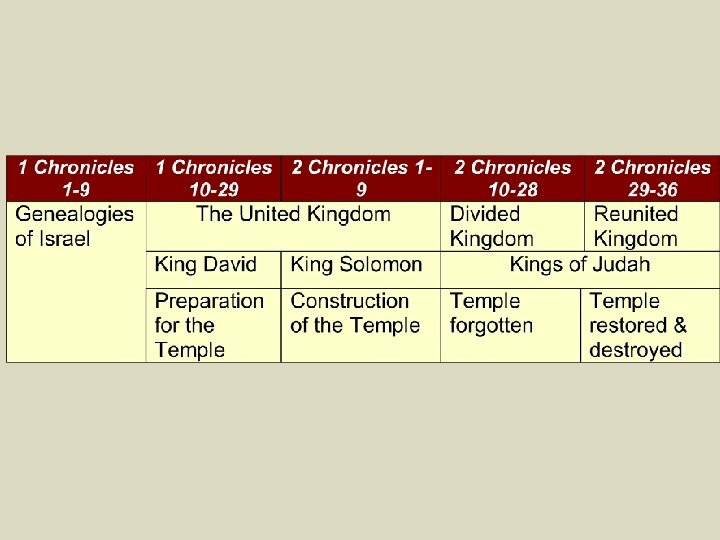 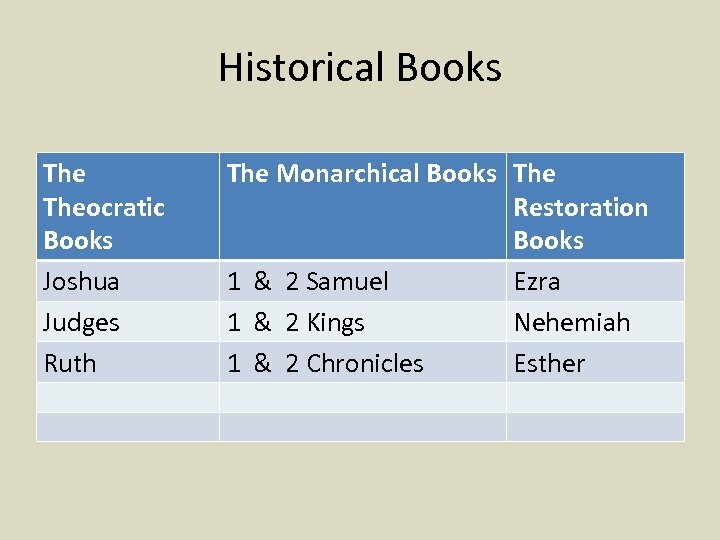 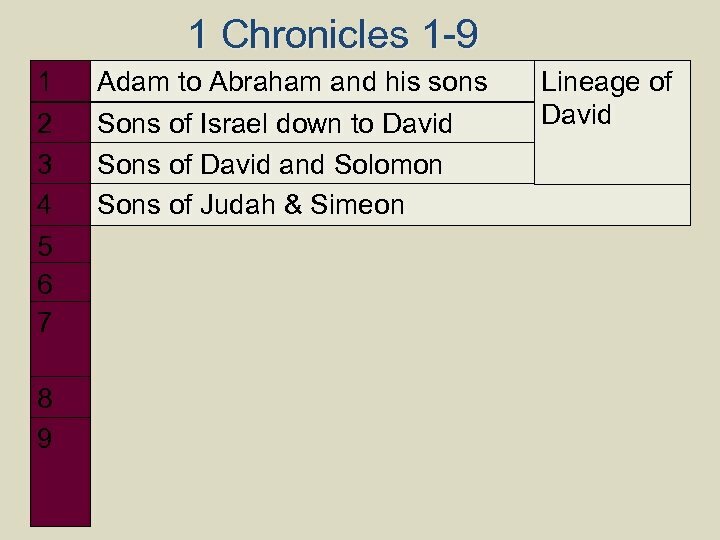 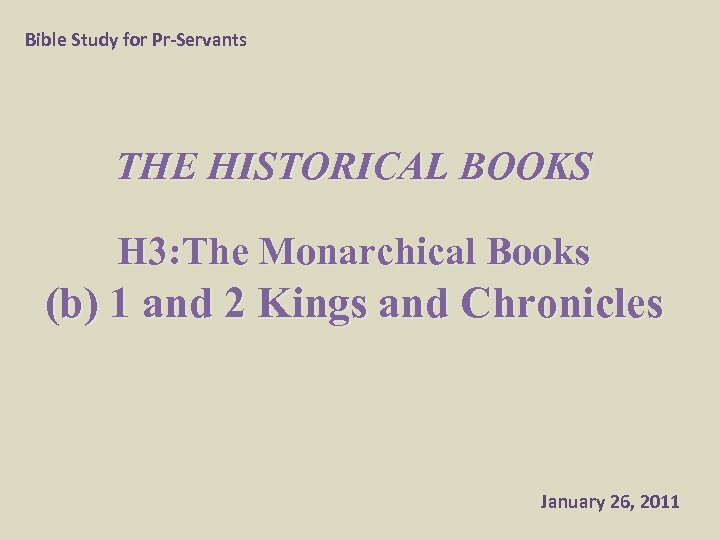 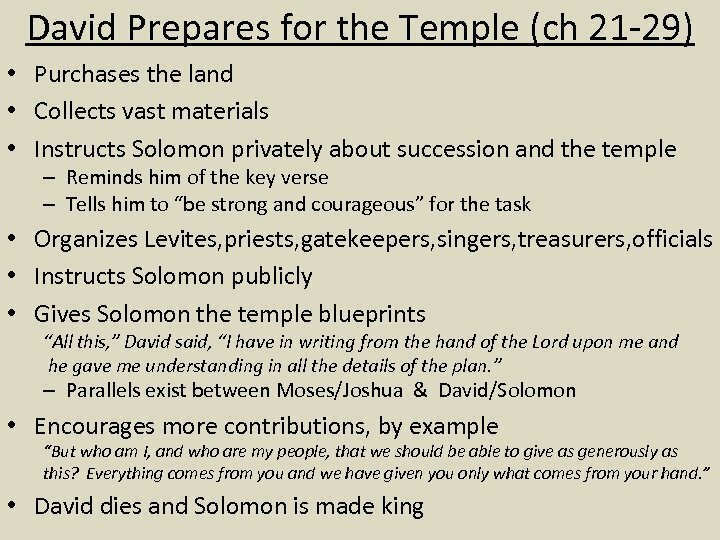 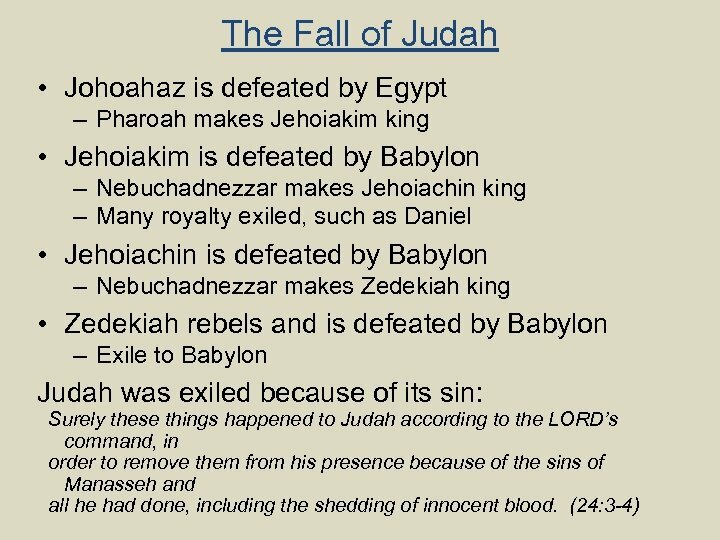 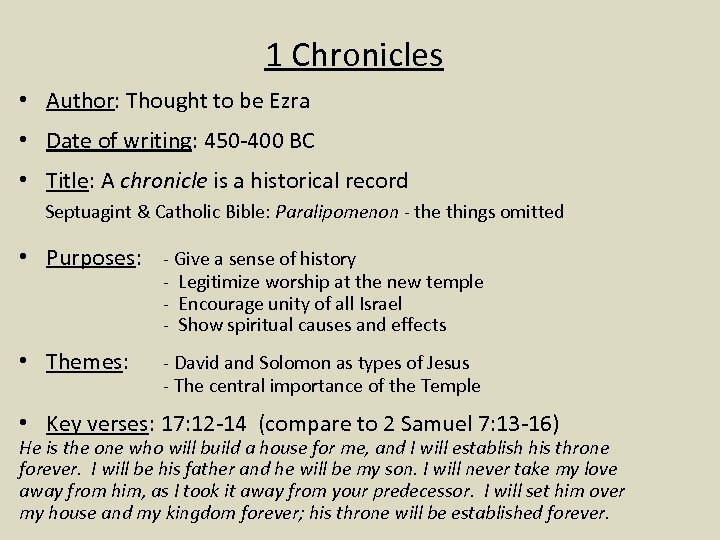 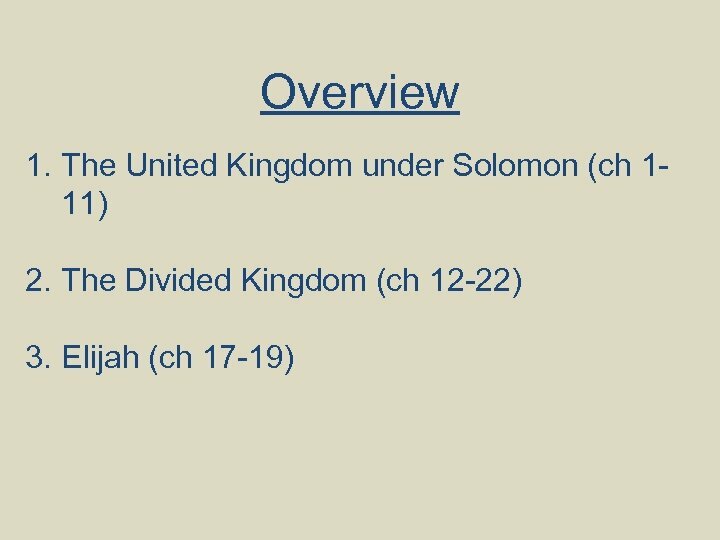 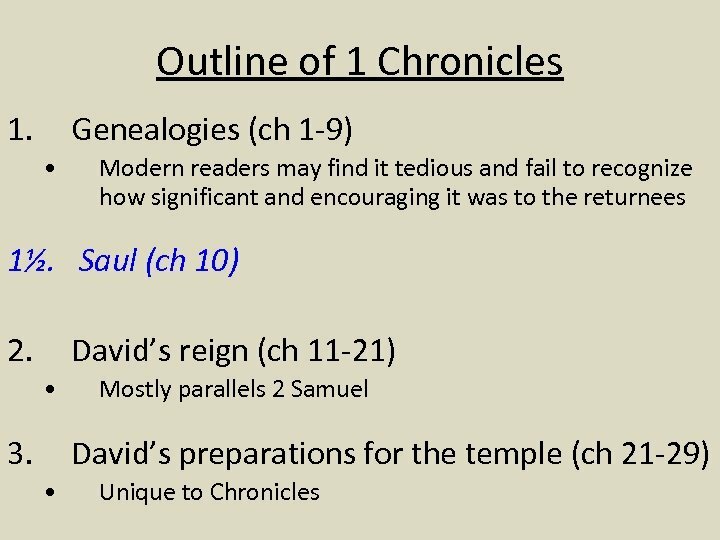 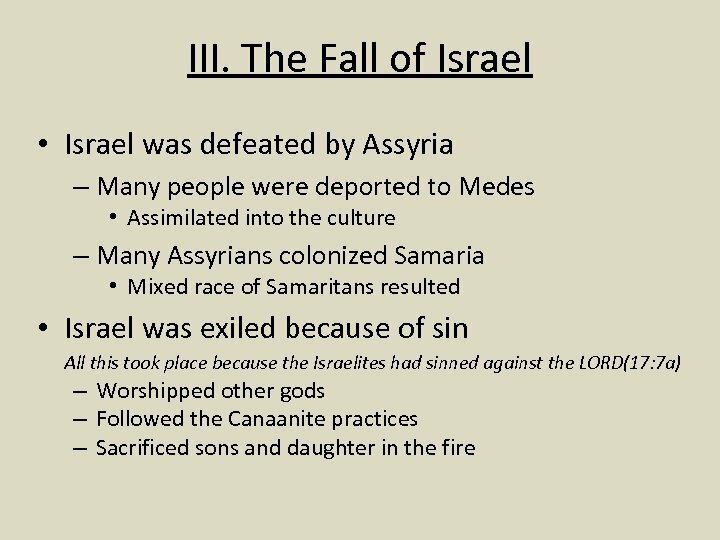 1 Chronicles • Author: Thought to be Ezra • Date of writing: 450 -400 BC • Title: A chronicle is a historical record Septuagint & Catholic Bible: Paralipomenon - the things omitted • Purposes: - Give a sense of history - Legitimize worship at the new temple - Encourage unity of all Israel - Show spiritual causes and effects • Themes: - David and Solomon as types of Jesus - The central importance of the Temple • Key verses: 17: 12 -14 (compare to 2 Samuel 7: 13 -16) He is the one who will build a house for me, and I will establish his throne forever. 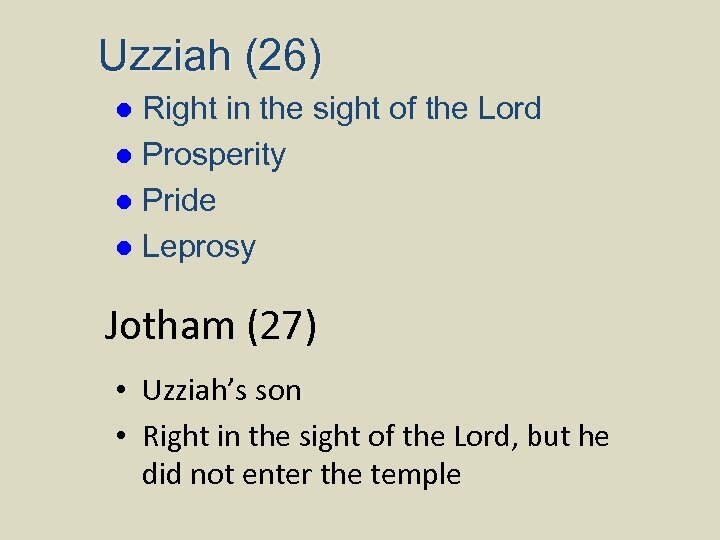 I will be his father and he will be my son. 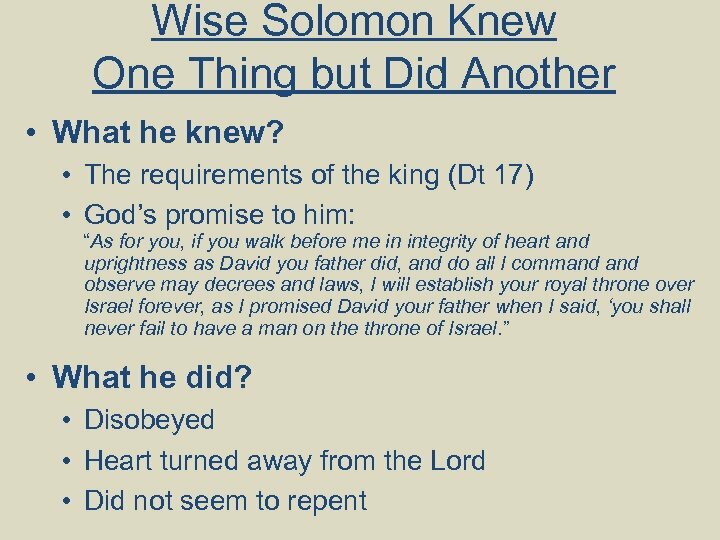 I will never take my love away from him, as I took it away from your predecessor. 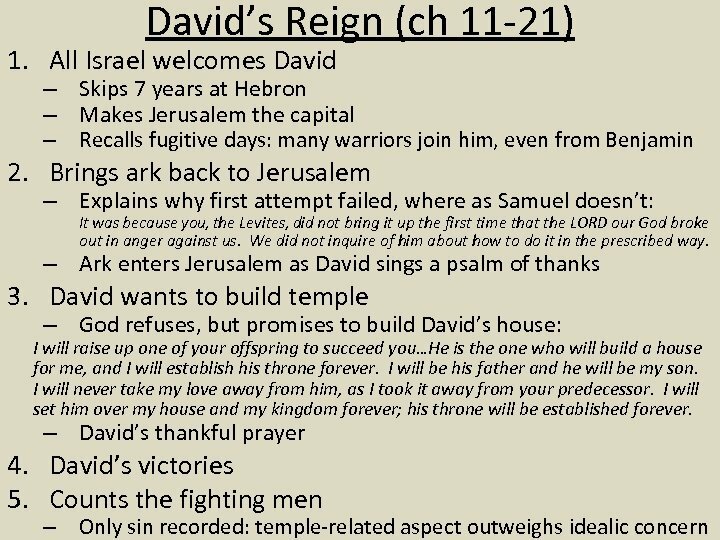 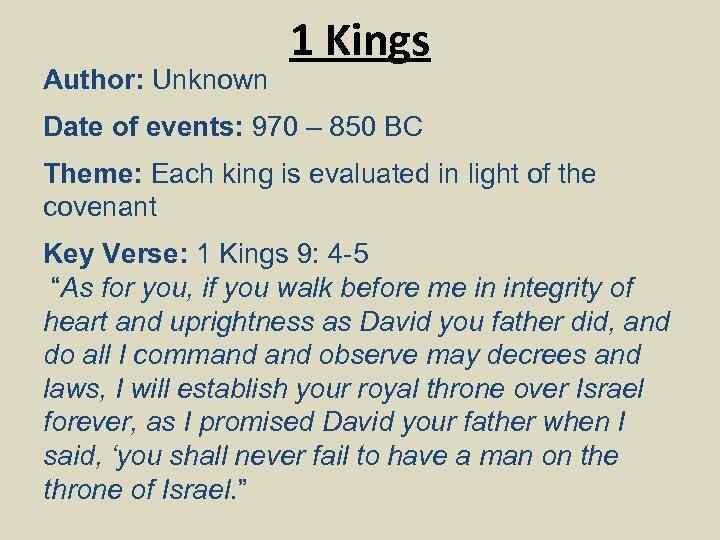 I will set him over my house and my kingdom forever; his throne will be established forever. 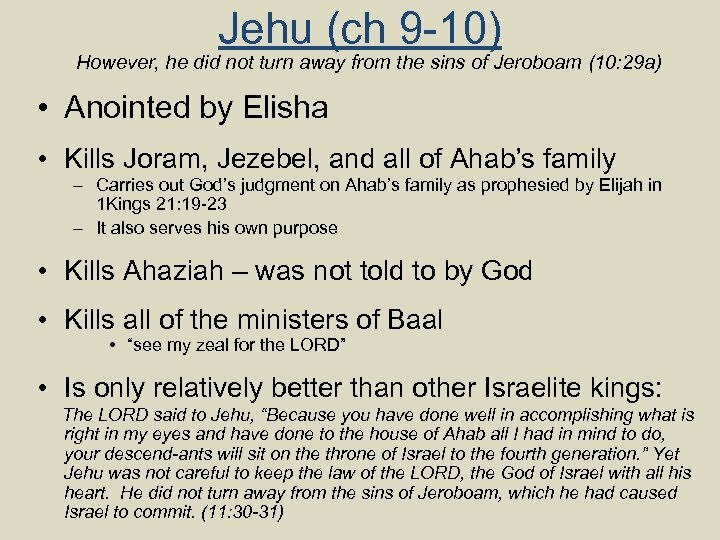 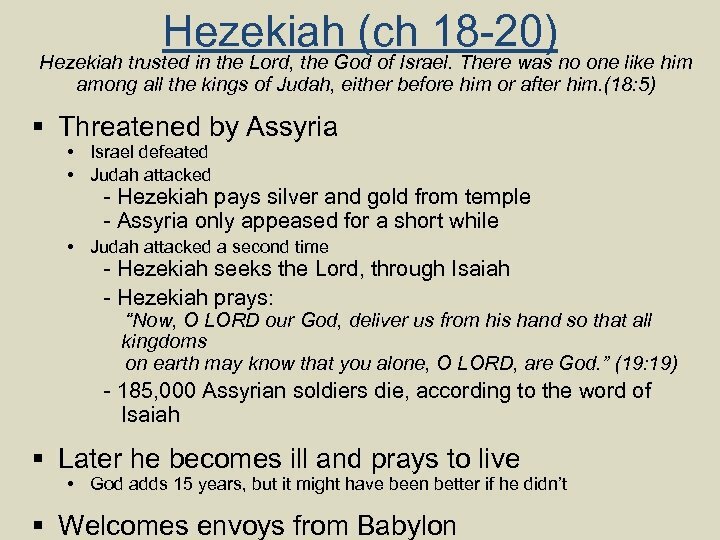 The Prayer of Jabez And Jabez was more honorable than his brothers, and his mother named him Jabez saying, “Because I bore him with pain. 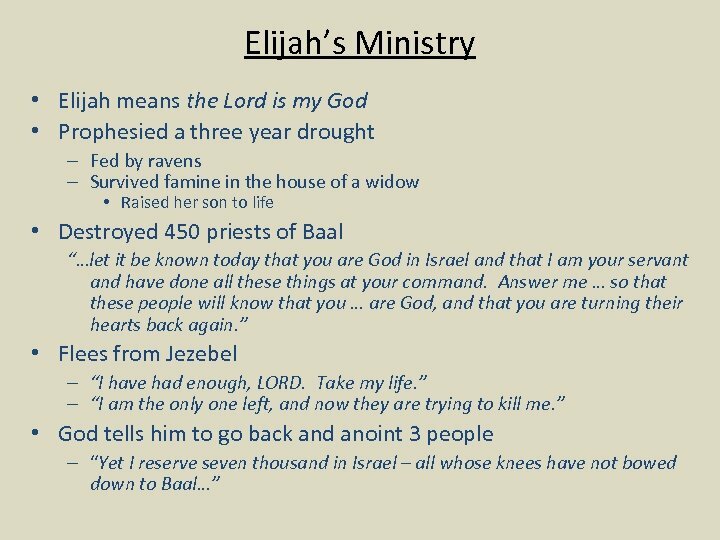 ” 10 Now Jabez called on the God of Israel, saying, “Oh that Thou wouldst bless me indeed, and enlarge my border, and that Thy hand might be with me, and that Thou wouldst keep me from harm, that it may not pain me!” And God granted him what he requested. 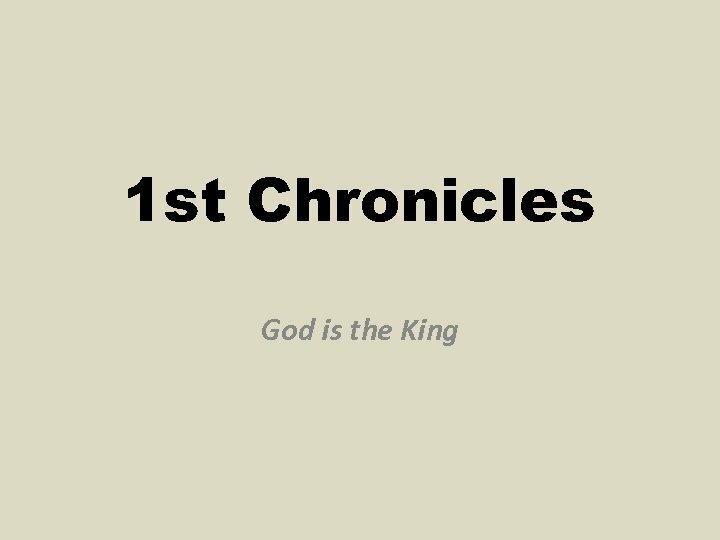 (1 Chronicles 4: 9 -10). 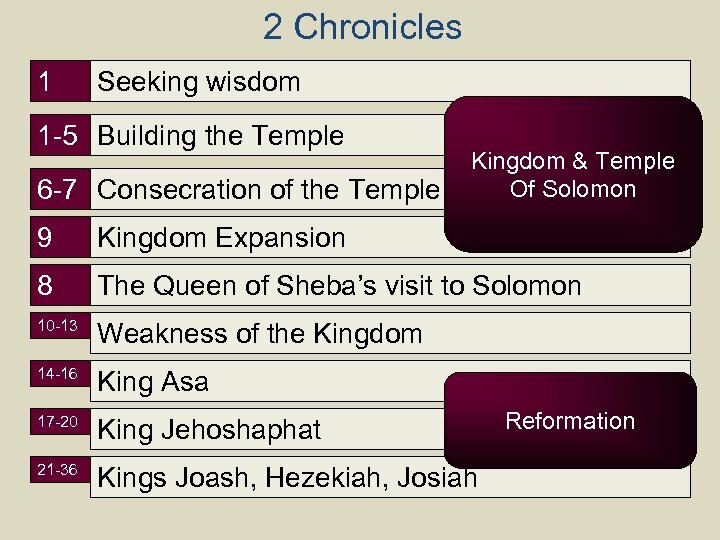 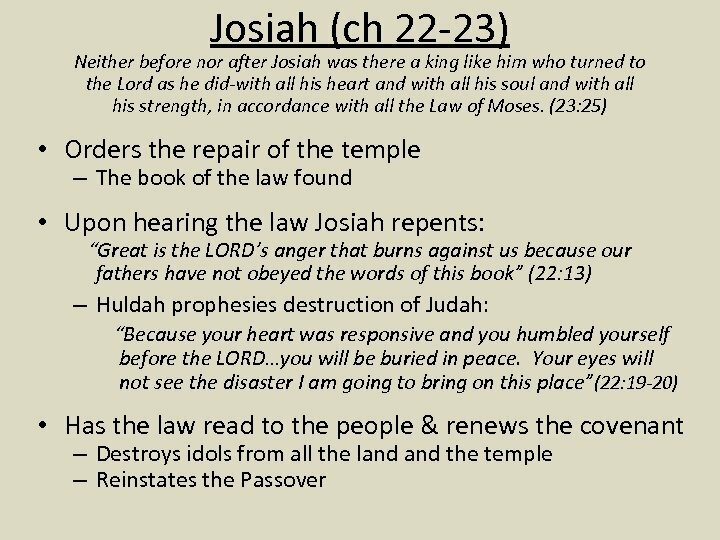 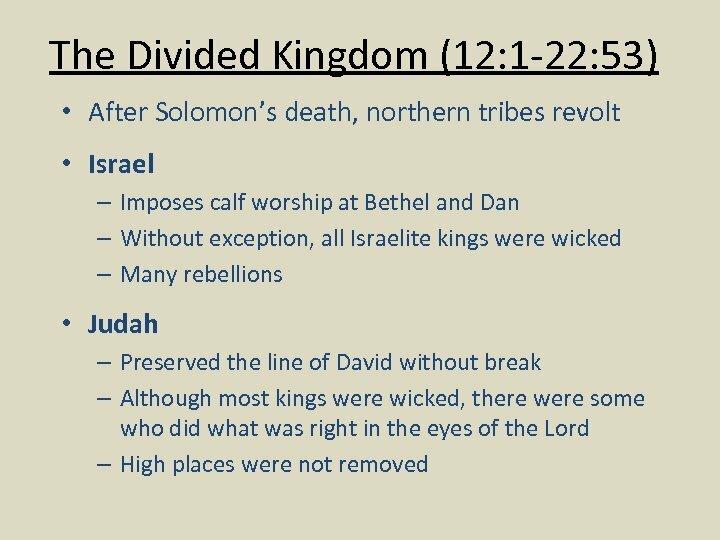 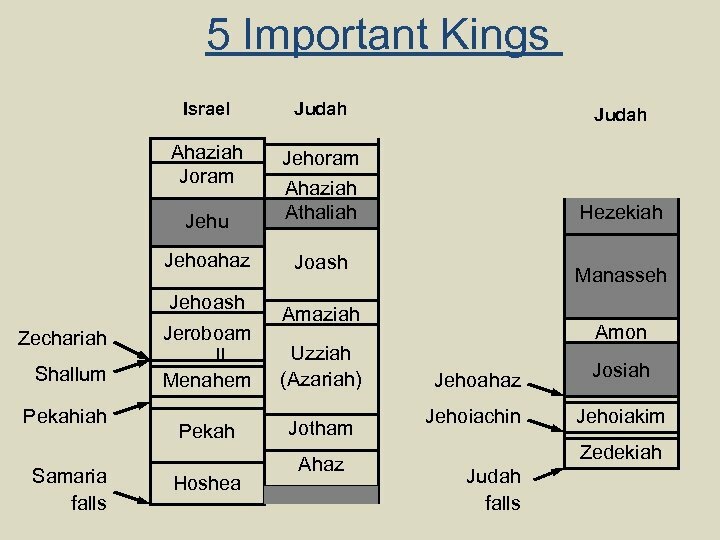 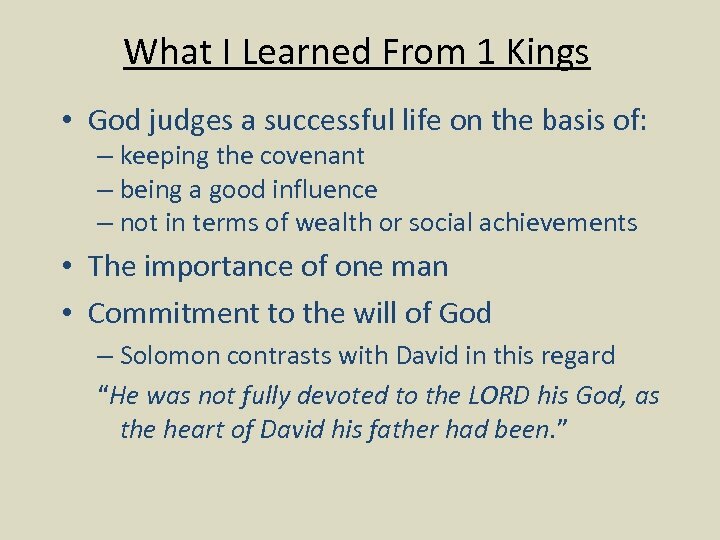 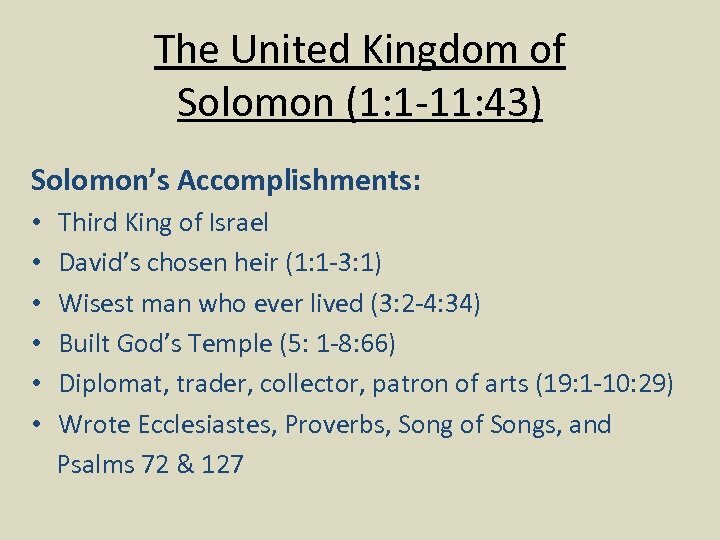 Asa (14 -16) • Reformation And Asa did good and right in the sight of the LORD his God, 3 for he removed the foreign altars and high places, tore down the sacred pillars, cut down the Asherim, 4 and commanded Judah to seek the LORD God of their fathers and to observe the law and the commandment. 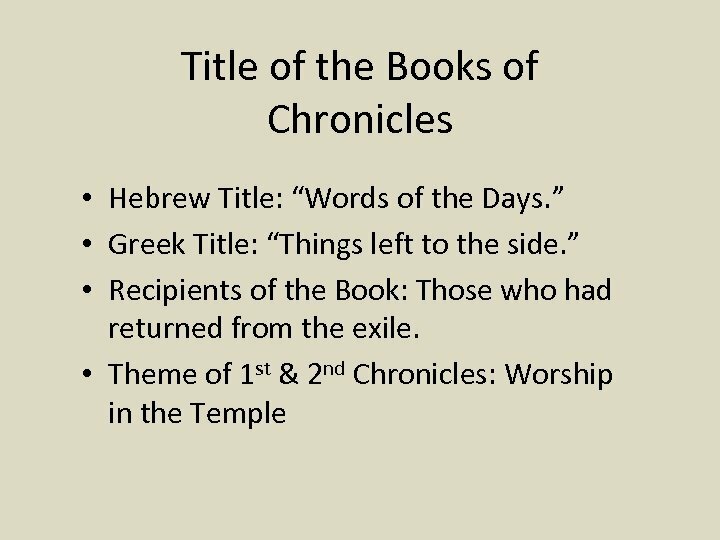 (2 Chronicles 14: 2 -4). 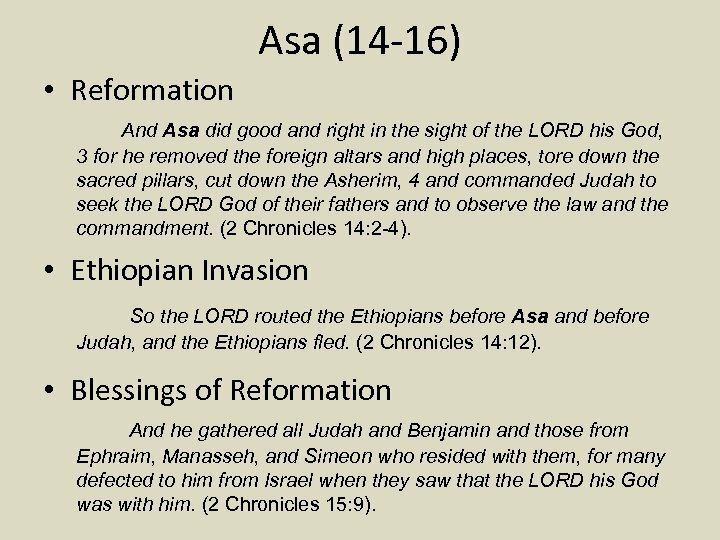 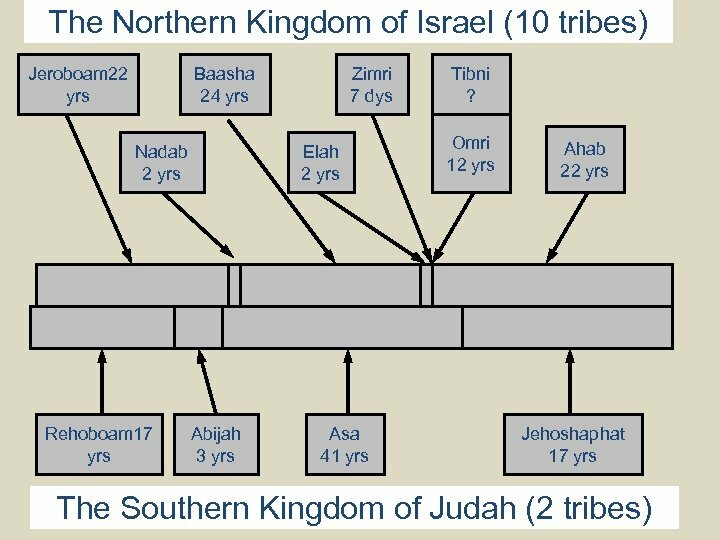 • Ethiopian Invasion So the LORD routed the Ethiopians before Asa and before Judah, and the Ethiopians fled. 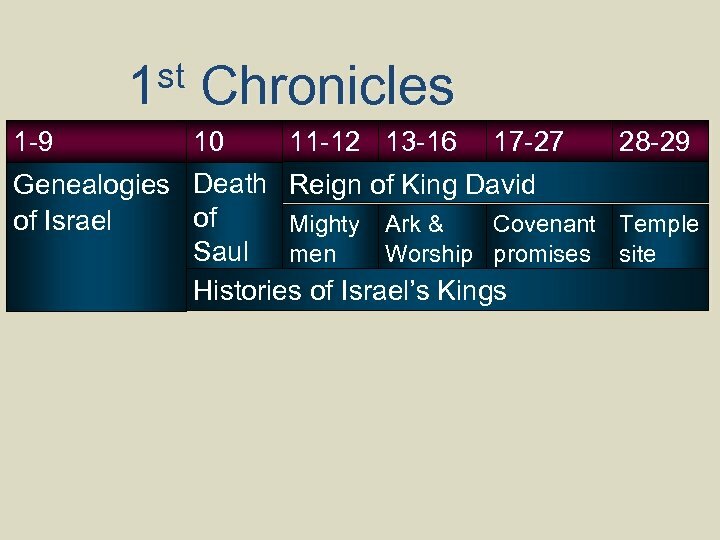 (2 Chronicles 14: 12). 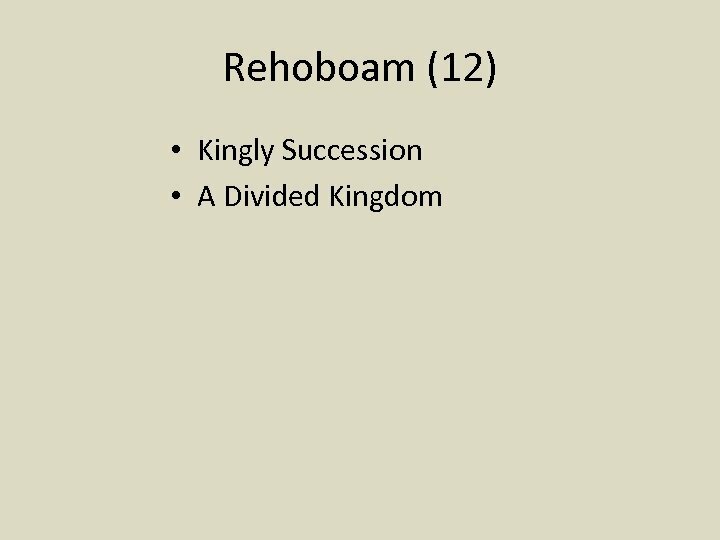 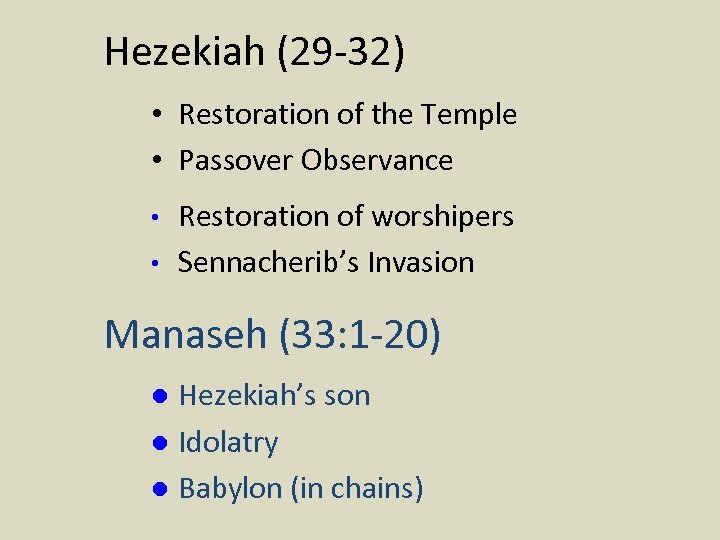 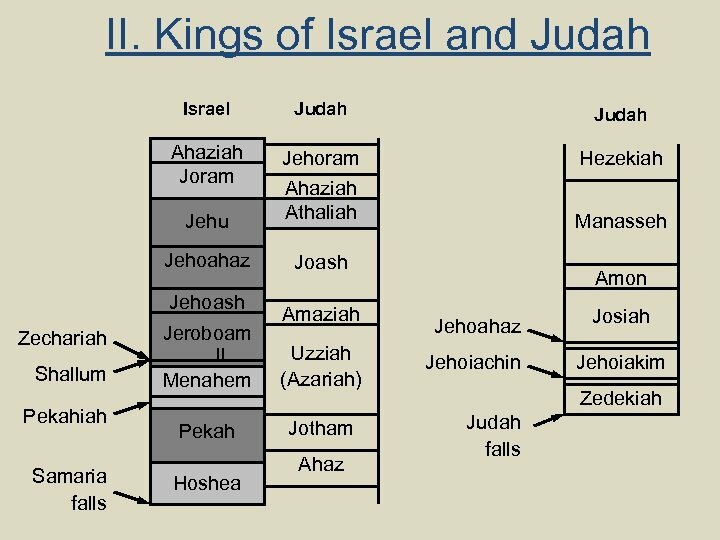 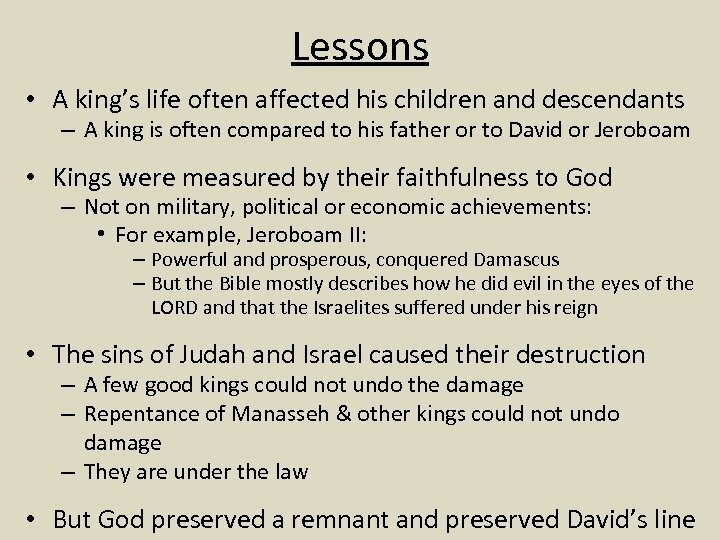 • Blessings of Reformation And he gathered all Judah and Benjamin and those from Ephraim, Manasseh, and Simeon who resided with them, for many defected to him from Israel when they saw that the LORD his God was with him. 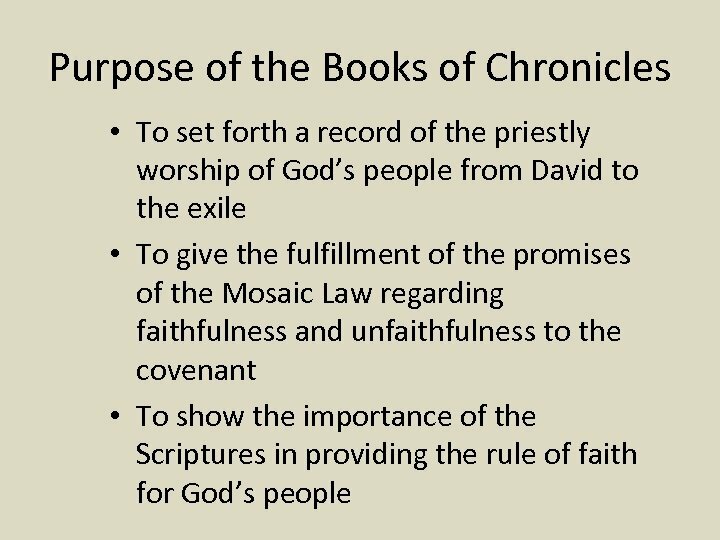 (2 Chronicles 15: 9). 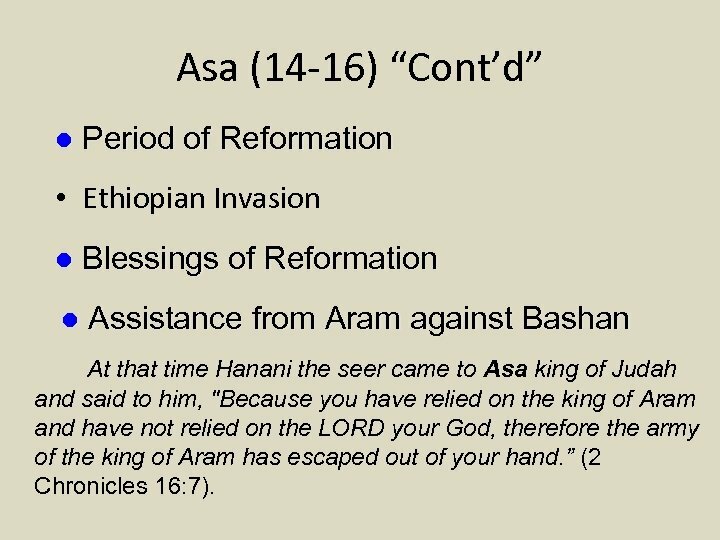 Asa (14 -16) “Cont’d” l Period of Reformation • Ethiopian Invasion l Blessings of Reformation l Assistance from Aram against Bashan At that time Hanani the seer came to Asa king of Judah and said to him, "Because you have relied on the king of Aram and have not relied on the LORD your God, therefore the army of the king of Aram has escaped out of your hand. 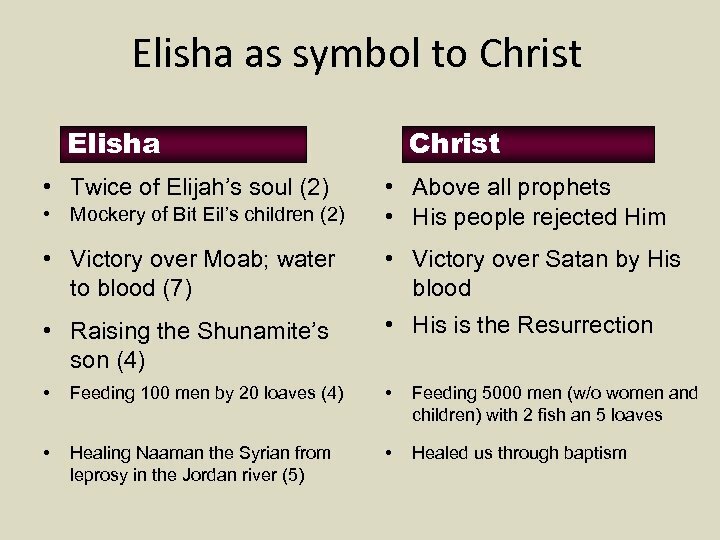 ” (2 Chronicles 16: 7).